Tuesday Debate: Should Hulk Hogan Have Passed the Torch to the Ultimate Warrior in Their Main Event Match at Wrestlemania VI? As everyone reading this site knows, in 1990 there were only two major titles in the WWF. One was the Intercontinental Title, which spanned most continents but not all, and the other was the World Title, which included all continents and oceans on this great planet we call Earth. At the beginning of 1990, the Ultimate Warrior was the Intercontinental Champion, which he won from the long standing champion the Honky Tonk Man. Due to his increasing popularity, it was decided that the Warrior would take on Hulk Hogan at Wrestlemania VI. This put Vince McMahon, the wrestlers of the WWF and the fans in an odd situation: the main event of the company's flagship show was going to be a face vs. face. This is wrestling lingo for good guy vs. good guy, back when morality in wrestling and life was much cleaner. Ultimate Warrior ultimately (pun intended) won the match, but to this day there is still a fierce debate about whether Hulk Hogan should have passed the metaphorical torch and literal world title to the Ultimate Warrior. Jake (Pro): We can easily sit here and say hindsight is 20/20 and dwell on the fact that Jim Warrior Hellwig is completely insane and handing him the reigns to the WWF may not have been smart. Yet, if we put ourselves into Vince McMahon's shoes we might find ourselves thinking a different way on this topic. The Ultimate Warrior, while not a great wrestler by any means, was still an excellent performer. His match quality was not much worse than the Hulkster's, and in fact he may have more good matches, ratio-wise. While he held the Intercontinental title, the Warrior managed to have a handful of good matches against Rick Rude, which is not necessarily surprising. This clearly showed Vince that Warrior, under the right circumstances, could have a good, main event caliber match. This was clearly the case at Wrestlemania VI, which was one of Hogan's and one of Warrior's best matches, yet neither of their best. As far as main events to Wrestlemania go, there are not many that beat that of VI. Putting the company in the hands of the Ultimate Warrior was the best decision at the time and nobody knew that fame would melt his brain like an ice cream cake in a sauna. Glenn (Con): The warning signs were on the wall from the beginning. The video clip you posted of Ultimate Warrior on the Arsenio Hall show (actually from right before Wrestlemania VI) should have been proof enough. Forgetting the wrestling angle, why would you pick someone to lead you who is an incomprehensible maniac? The United States of America recently picked Barack Obama to be their public face to the world and most sane people agree this was the correct decision. Even George Bush, a man so vile and pathetic that he was born on third and thinks he got a triple, was a better leader of the US than Ultimate Warrior was of the WWF. The Ultimate Warrior was a lunatic who couldn't even behave like a normal person when on a talk show - one of the rare times when a wrestler was exposed to mainstream audiences. Hulk Hogan would have went on the Arsenio Hall show, calmly discussed the thrill of a life wrestling event and then defending double murder. Jake (Pro): Warrior's character was an incomprehensible maniac and there are many video clips on YouTube that could be used as evidence for that trial. This is no trial, though. Ultimate Warrior was the most over (which means popular with the crowd) wrestler at the time and Hogan's popularity was starting to wain. Hogan had to pass the torch, and what makes that moment so great is that Hogan has not put anybody over in such a decisive way at such a huge event since. The Hulkster came back to WWE earlier in this decade and cleanly lost to many people and even held the tag titles with Edge. Even though, during this run, Hogan tapped to Kurt Angle, it still did not have the impact that it did at Wrestlemania VI. 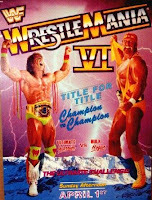 If not for the Ultimate Warrior, who could have Hogan lost the belt to? Koko B. Ware, Earthquake, Rick Martel, Big Bossman, Rick Rude, Dusty Rhodes, Ted DiBiase? Losing the title to any of those guys would not have had the same impact, nor would any of those people have been able to carry the company for as long as Warrior did. Incidentally, Ultimate Warrior ended up losing his title to Sgt. Slaughter, who was not even around during Wrestlemania VI. Glenn (Con): Sgt. Slaughter was originally a blindly (is there any other kind?) pro-America face. Then when Iraq invaded Kuwait and the US became embroiled in the so-called Gulf War, Slaughter returned as a pro-Iraq traitor heel. I'm glad you brought him up because Slaughter was another bad choice to carry the company, but Vince McMahon put the World Title on him at Royal Rumble 1991 so a face could defeat him in the Wrestlemania VII main event. At Wrestlemania VI, the options of passing the torch were limited because Hogan currently held the title and who would want to see a bad guy (heel) take it away from him? People don't like sad endings; they like happy ones. That's why Titantic did so poorly and Beverly Hills Chihuaua was so popular. Hulk Hogan should have passed the torch to someone better like Ted Dibiase or Randy Savage, who he defeated the previous Wrestlemania. Hell, even Earthquake, who was a 300+ pound clod, would have been a better champion than Warrior. You never saw it on interviews, but Earthquake (real name John Tenta) actually had a masters in philosophy from Brown. He would have represented the WWF better on a low-brow show like Arsenio Hall or even a high brow show like 60 Minutes. Jake (Pro): The argument that Earthquake could have carried the company as well as the Warrior is ludicrous. Even when you make up fake facts about John Tenta it still is outrageous. Randy Savage had already been the champion and there would have been no real impact to his win. He obviously held it again when he defeated Ric Flair at Wrestlemania VIII in a great match. "The Million Dollar Man" Ted DiBiase would have been a good WWF World Champion, but he had already purchased the title one time before from Andre the Giant, which was overturned by Jack Tunney, who at the time was the WWF President. There simply was nobody who could have reasonably held the title for the length they needed him to hold the title at the time. I agree that Sgt. Slaughter was a poor choice for champion, since he hadn't had a good match in years and was not that over, but he was very short term. Luckily for WWF, Ric Flair and the Undertaker soon made their way in. If anything, the situation with Warrior was good because it forced them to develop more talent as main eventers. Glenn (Con): I just hate the Ultimate Warrior. He has spoken derogatory about gays and while I'm not gay I don't take too kindly to bigots - whether they be in the US Congress, the Missouri General Assembly or holding the world title of my favorite wrestling company. Sometimes you have to make hard decisions even if they're politically unpopular. For example, Bush administration officials who authorized and directed people to be tortured and illegally wiretapped should be prosecuted even if it will make Republicans mad. In that same vein, the Ultimate Warrior should not have been given the title even if it made the fans happy. Watching Warrior's matches was almost as bad as the torture America committed from 2002-2009 but not quite. It's not like we were having our heads slammed against the wall or be forced to defecate in a diaper, though Warrior did slam some people using his infamous gorilla press. Jake (Pro): Oh please, Warrior wasn't the best wrestler, but he could pull out a good match when it counted. The reason they took the title off of him is because of his decrease in popularity over his title run. I am not arguing that Warrior is a good human being, or even a good wrestler. All I'm saying is that, from a business standpoint, at the time Warrior was the only choice for the main event of Wrestlemania VI. We could debate that he should have lost the title sooner, perhaps, and I would be on your side. This debate is about "the grandest stage of all" Wrestlemania. Rick Rude vs. Hulk Hogan as the main event of Wrestlemania would have been pretty weak. That was probably the closest thing to a possible non-Warrior main event they could have done. Glenn (Con): I guess I see your point. I just think Warrior did long term damage to the business that someone else wouldn't have done. Such as Tugboat, another fat buffoon type wrestler who had a mullet and a heart of gold. If he defeated Hulk Hogan at Wrestlemania VI, business would have tanked in the immediate future but then rebounded as Tugboat proved himself. Toot toot! i stayed up 20ish extra minutes so i could read this last night. i always get aroused when you two talk about wrestling so let's just say i had some EXCITING dreams. Tugboat would have been the worst world champion ever. In an RF shoot interview with Fred Ottman (Tugboat), he states that Shawn Michaels was supposed to drop the world title to him in early 1997 but forfeited it instead because he did not want to lose to the "Shockmaster."